Washington DC is not a city we’re too familiar with, we’d been here before, but this trip we wanted to see things we hadn’t seen on that sole visit in 2007. Of course we had all the standard history to see, so we began our day with the infamous Ford’s Theater where President Abraham Lincoln lost his life to assassin John Wilkes Booth on April 14, 1865, soon after securing a victory of the Civil War. The location is preserved together with The Peterson House as “Ford’s Theater National Historic Site” run by the National Park Service. We made our way into the lobby, grabbed our free tickets and made our way the museum which, on this Tuesday was crammed wall to wall with shrill school kids and waddling retirees – not the best combination for enjoying a museum. Together with our good friend Barb, we made quick work of the museum stopping only briefly to watch a movie about the interesting, and often strained, respectful relationship and ultimate friendship between Lincoln and Frederick Douglas an abolitionist and former slave. The exhibits are quite interesting, offering chilling insight into the notorious night, including the very suit Lincoln wore, the Derringer pistol used to carry out the shooting, Booth’s diary and the original door to Lincoln’s theatre box. 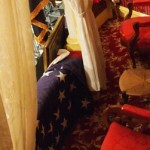 The blood-stained chair in which he was sitting is apparently on display at The Henry Ford Museum in Dearborn, MI. We then walked up to our way to the infamous balcony, which is introduced through a long hall featuring a timeline of the day’s events from Lincoln and Booth’s perspective. It humanizes both participants, removing the deed and speaking to the mundane activities (like how they got to the theater) leading up to the encounter. Finally, the balcony was in our sights. The red, white and blue drapes the balcony, and inside the box, the theater has added replica furniture representing this night. We then made our way across the street to The Peterson House where Lincoln was taken following the shooting and ultimately died the next day. Three rooms are on display. It seems we’ve been chasing Lincoln across this nation, visiting his boyhood home, Lincoln’s New Salem, Springfield and now the place where he met his end.